Can I Feed My Dog Pineapple? Can Dogs Eat Pineapple? There’s nothing quite like a summer picnic or a cookout with friends, family, and (of course) our four-legged family members. But when it comes to treating Fido to some fresh summer fruits, some are fine, but others aren’t. Summer treats like grapes, citrus fruits, and avocado aren’t good for your dog to ingest. But what about fresh pineapple? Can dogs eat pineapple? With its sweet, tart, and super juicy flavor, pineapple is an obvious favorite among hosts and guests. 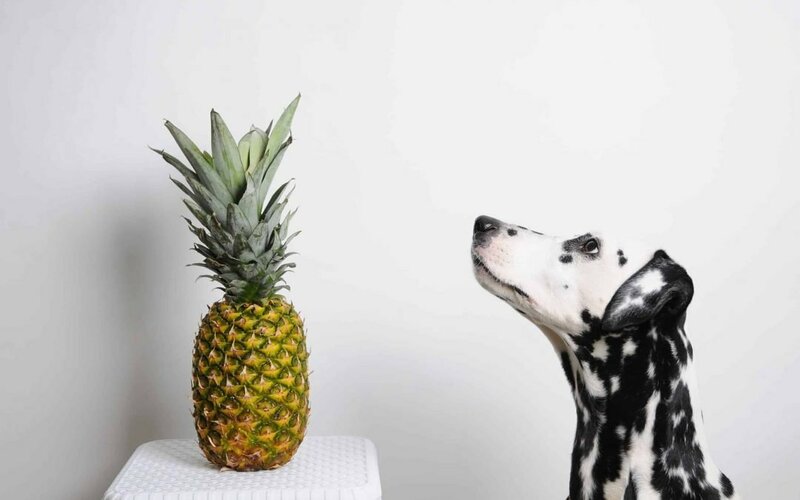 And whether you love pineapple so much that you want to give it to your pooch, or they just can’t help themselves from table surfing, it is good to know whether or not it is safe for them to eat. Before you give your dog any “human” food, always be sure to check that it is safe for them to eat. So, when it comes to this tropical treat, what’s the verdict? Can dogs eat pineapple? Why is vitamin C so great?  Well, for starters, it has been shown to help support the immune system of dogs when given in relatively small doses (30 and 60 mg) over a period of time.2 By boosting your dog’s immune system, you may be helping them stave off illness that could otherwise negatively impact their health. So, why not try a little bit of fresh pineapple to give them that extra bit of vitamin C? When introducing your dog to any new food, be sure to only give them very small bits. Small doses of new foods are great for several reasons. For one, if they don’t like it, then you haven’t wasted much. Secondly, small portions make it easy for your dog to chew and swallow, hopefully avoiding any choking hazards. Lastly, small portions make it easier to monitor how their body is reacting to the food. If they have an allergic reaction, or it upsets their stomach, it’s better that they have just a little bit versus a huge portion. So after Fido’s eaten a little pineapple, make sure you watch them to see how they digest it. 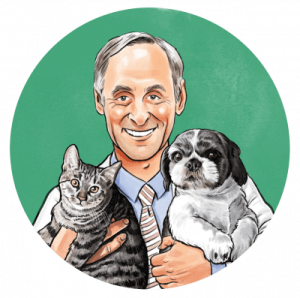 If they throw it up, or their stool doesn’t seem right, be sure to consult your vet. Don’t give them any more of the food until your vet gives you the green light. In addition to being a great source of vitamin C, raw pineapple is loaded with other vitamins and minerals that are great for dogs. Fresh pineapple is made up of 87 percent water. It’s a great way to keep your pooch hydrated during the summer – while also making them feel extra special. 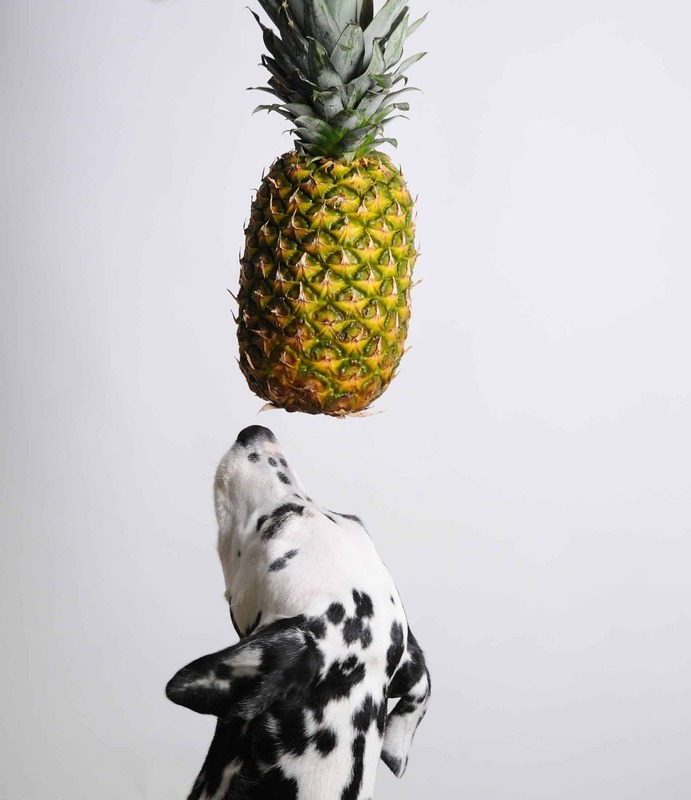 When people ask, “Can dogs eat pineapple?” the short answer is yes, but like many things, moderation is key. And understanding all the good stuff in pineapple (in addition to the not-so-good-stuff” is just as important. For instance, while pineapple is natural, it also contains a lot of natural sugars. So if your dog has diabetes, or is overweight, be sure to consult your veterinarian before giving them pineapple, since dogs’ digestive systems (especially heavier dogs) aren’t well-equipped to handle sugar. When giving your dog fresh pineapple, make sure you only give them the juicy, fleshy part of the fruit. Never give them the core. It’s too hard, and it’s a choking hazard. Also, don’t feed your dog the spiny outside of the pineapple, either. It doesn’t have much nutritional value, and it can hurt them while eating and swallowing. And don’t give your dog canned pineapple: it contains extra sugars that your dog doesn’t need. There you have it. 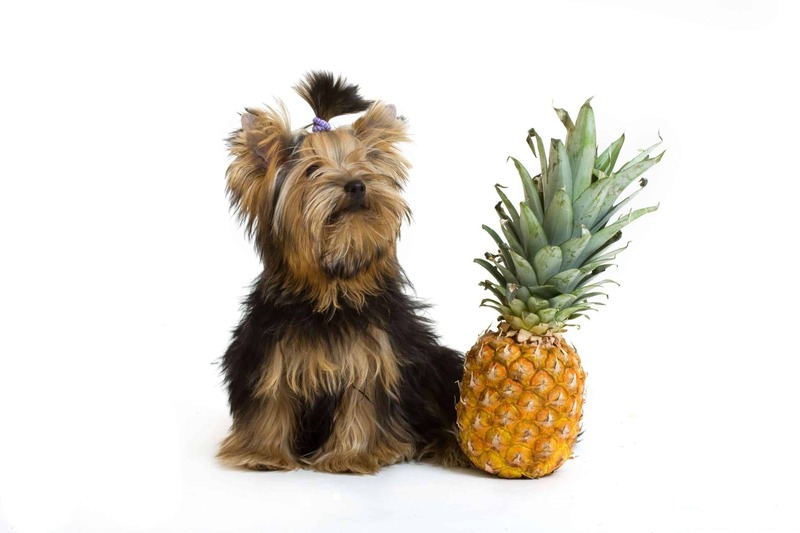 An extra treat of pineapple for your dog will make both you and your pup smile.